The latest edition of Open Roberta Lab has many cool new features and long time LEGO users will be excited by the addition of NXT as a supported platform. Unlike the EV3, which still requires an SD card and WiFi dongle, the NXT will work with the default firmware and a USB cable. To use Open Roberta with your NXT, you’ll first need to download the appropriate USB Program for your operating system (https://mp-devel.iais.fraunhofer.de/wiki/display/ORInfo/USB+Verbindung). This allows the software to send the programs you create to the NXT. Once the USB program is installed, plug in your NXT, and click “connect”. This will generate a series of numbers and letters called a token. The token should appear at the top of the window. By typing the token into the Open Roberta Lab connect box, your robot will be connected to Open Roberta! You should hear a beeping noise and see the name of your NXT appear at the top of the computer screen to confirm that you are connected. After the setup process is done, you can create programs and download them via USB to the NXT brick by hitting the “run” button. Once this is completed, your programs will appear normally on the NXT and can be accessed by navigating to My Files, Software Files, and then the name of your program. Creating programs is made easy by a simple drag-and-drop platform that allows users to create complex programs. Since it is cloud based, there are no issues about where to save files. Instead, students can simply save programs to their Open Roberta account. This enables users to access their programs from any computer and run them with any NXT Brick. Students can also continue working on their programs from home by simply logging into the site with their username and password. In addition to NXT support, this release of Open Roberta has two cool features: a welcome tour for new users and a robot simulator. The welcome tour takes new users through the process of creating and running a program. This is really helpful if you’ve never used Open Roberta before. The welcome tour highlights the other feature: the robot simulator. 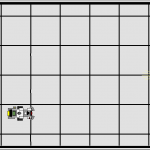 The robot simulator shows, on your computer screen, how your robot will execute your program, before you download it to your robot. This is great for troubleshooting or, or example, when students are working on programs at home and don’t have a robot with them for testing. However, the simulator only works with the default robot configuration, which is a two wheeled robot with an ultrasonic sensor, a touch sensor, a color sensor, and the display of an LED. Be careful not to change where the motors and sensors are plugged in if you want to take advantage of the simulator. In conclusion, Open Roberta Lab allows you to program your EV3 or NXT with an easy-to-use, cloud-based, drag-and-drop program. The addition of NXT support is great for schools and organizations who are still using NXT to teach students about robotics. 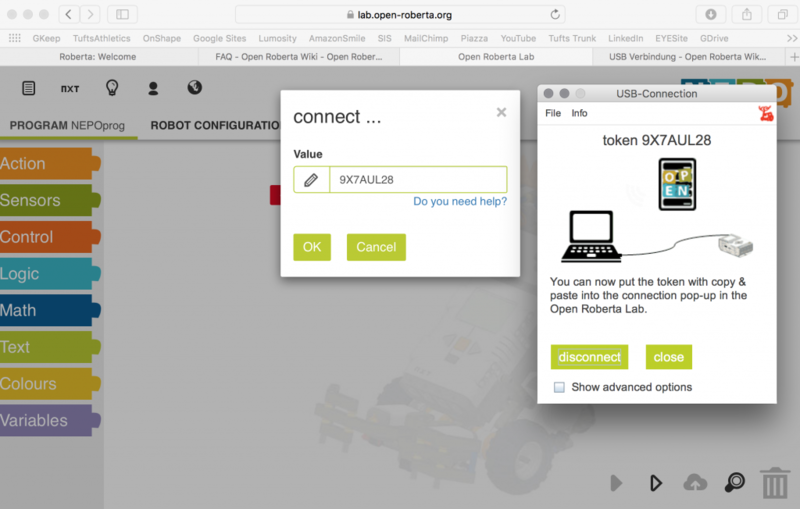 The Open Roberta update also includes improvements and new features that improve the overall user experience, making Open Roberta a great way to control both NXT and EV3 robots. Sara is an undergraduate researcher at the Tufts Center for Engineering Education and Outreach, where she has been working since 2013. She is also the co-founder of Educating Young Engineers, which is an organization dedicated to providing elementary school students with access to engineering education.